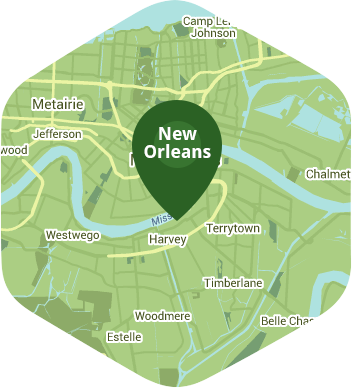 Book a skilled lawn pro in Marrero. Backed by a total satisfaction guarantee and amazing customer support. As a Marrero homeowner, you love the unique flavor of your town's culture. The combination of mysterious and awesome nature, the friendly faces, the beautiful homes, the music, and the only-in-Louisiana cuisine — it's a heady mix that makes Marrero like no other. We love Marrero too, and specifically, we love its lawns. We're Lawn Love, and we're a different kind of lawn care company, combining modern convenience with old-fashioned service and quality. With just a mouse-click or a tap on your mobile device, you can easily and quickly book our independent lawn care professionals to take care of your mowing, raking, weeding, or seeding. And the result? A plush, healthy green lawn that looks amazing, year in and year out. Why wait? Call Lawn Love today at 504-437-1838 or try out our convenient two-minute quote, and let Lawn Love give you the lawn you've always wanted, the easy way! Rated 4.79 / 5 stars in 1,184 Marrero customer reviews. It looks like the expected precipitation in Marrero is 0.45 inches, which means your lawn got a nice soaking—leave those sprinklers off today. Dusk and dawn are the best times to water your lawn (the sun will rise at 6:25 AM and set at 7:32 PM today in Marrero). Here are some average lawn care prices for homes in Marrero. Average lawn size 3,341 sq. ft.